joanne, remember that i am no expert at photography hah. those tips i wrote are what i learned lang din from professional photographers. but i do love the thought that you appreciated my 1st attempt on food photography! The blue is stunning. I really would like to jump right in. I miss Boracay! Lovely shot. 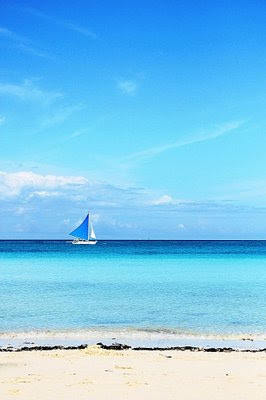 wow..as always...Boracay is paradise...Happy WW. i love the bluish sea and sky. Happy WW! Wow, that is beautiful! Wish I was there! this is a really lovely picture, I love the colors in it!!! LOVE it! I'm ready for a beach trip! looks like a wonderful beach to sit a spell... nice capture. The blues are fantastic! I'm assuming you were having an umbrella drink and relaxing in a hammock while taking this picture. Even if you weren't, don't ruin my fantasy - ahhhh, take me away. That looks like a perfect day for a sail. I think this picture includes all my favorite shades of blue! Wowza! Boy, would I like to jump straight into that shot, wade through those aqua blue waters...leave this desk job far behind! A beautiful capture! The blues are fabulous and I love boats! The boat makes image. I wish I was there in your picture now, wonderful. The road that you saw with me go to our cottage in the country in Roslagen. beautiful!!! love the sky, the sea and everything about it! Wonderful blue! It looks so peaceful. I hope I can go back soon. That is a marvelous photo. So beautiful and peaceful.